This service manages wood-borer / powder post beetle that have destructive activities on wooden materials. D N A Pest Management Technologies Pvt.ltd. Supported by our talented professionals, we are offering an exceptional assortment of Wood Borer Treatment. Wood borers are tiny Powder Post beetles that dig holes in wood. They can kill or damage trees and things made from wood like furniture. There are even documented cases that powder post beetles have destroyed houses. We are among the reputed organizations, highly engaged in providing an optimum quality Wood Borer Management Service. The provided service is carried out by our skilled professionals using the finest grade tools and modern technology. This service is performed in the best possible manner within the scheduled time-frame. Wood borers belong to the family of whose larval or adult forms eat and destroy wood.They are commonly detected a few years after new construction.Wood Borers turn wood into a mass of wood dust.The tiny pin holes in a wooden surface is a symptom of wood borer attack.Wood borer infestations are far more likely to happen in areas with high humidity, such as poorly-ventilated crawl spaces. Woodboring are commonly detected a few years after new construction. The lumber supply may have contained wood infected with beetle eggs or larvae, and since beetle life cycles can be one or more years, several years may pass before the presence of becomes noticeable. Powder post beetles also known as Woodborers. Unlike termite it is equally important pest, which destroys wood. The main sign of infestation is yellow & white powder falling from furniture, which is an excreta of organism. Active infestations may be managed by residual spraying of insecticide to the infested wooden articles. We are also dealing in preventive treatment to the wooden articles to protect from further attacks of powder-post beetles by dipping or adequate coating of special insecticide to the surface of wood. Almost all the furniture of house are made up of wood. 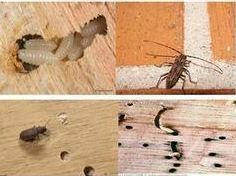 The wood borer larva badly damage wood because they depends upon wood for their food and shelter..